Hi, I've read that David has done a lot of Theatre work in and around New York. Does anyone know if he is going to be doing anything this year??? I don't know of anything specifically, but you might want to keep an eye on the Shakespeare Theatre of New Jersey's website; he's performed several times there and was at their recent fundraiser. Sadly, I've found out about his performances at the STNJ after the runs have concluded...but should you be anywhere nearby, all of their performances are first-rate. OT — Michelle, you're doing a fantastic job with this site — well done! Agreed in full. I also found out about a Cabaret performance he's doing in New York, but it's already sold out, because none of us found it until last week, when tickets went on sale at the end of March. Thanks for the info, if you hear of anything can you post it. I'm in New York in June and it would be great to see him in something!! Great news everybody! I've just received word from someone today that David will be acting in a play in Pittsburgh at the New Hazlett Theater from June 4 to June 28. The play is called "Burn This." 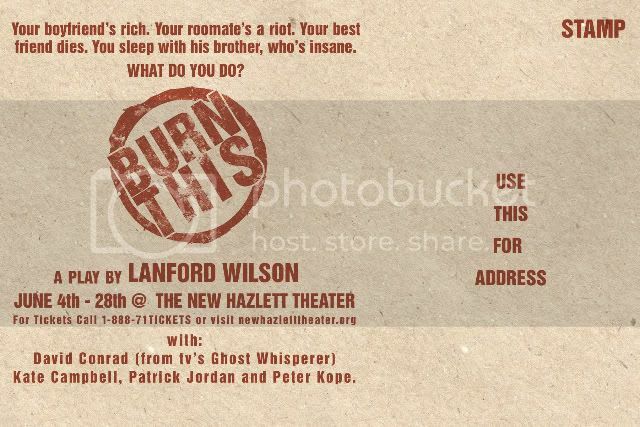 Check www.newhazletttheater.org for info....right now, there doesn't appear to be anything, but I will let you all know as soon as I find more out. Gosh I wish I lived closer too Pittsburgh, stupid Canada! Why can't David come here? It sounds like a really interesting play though! Just posted this on another post but just read on People.com that JLH is directing and producing the first episode of season 5 and is due back on set June 19th. Must be why David's play runs until June 21st. He has to go back to work. The theatre just added the rest of the dates not too long ago...I don't know how that ties into the June 19th return, unless he's not due to shoot scenes until after that.